The salaries paid to the software development professionals in your team will have a significant impact on your total development costs and “startup runway“. It’s vital that tech companies looking to operate in Vietnam have an informed view of salaries, taxes and expected benefits in the country. So, what is the typical salary range of a software developer in Vietnam? What about other key team members? Here is our overview, based on data from Payscale, Glassdoor and several other salary surveys conducted recently in Vietnam by VietnamWorks, First Alliances and others. We also keep a watchful eye on job listing sites. Salaries in Vietnam are usually discussed on a monthly basis. It is rare to talk in terms of an annual package. Monthly salary ranges are provided and discussed below, presented in $USD to make it easier to compare. The Vietnamese Dong (VND) is generally stable and is showing slight devaluation over the long term. Salaries for junior developers (2-3 years experience) may be as low as $500 per month up to $1,200. 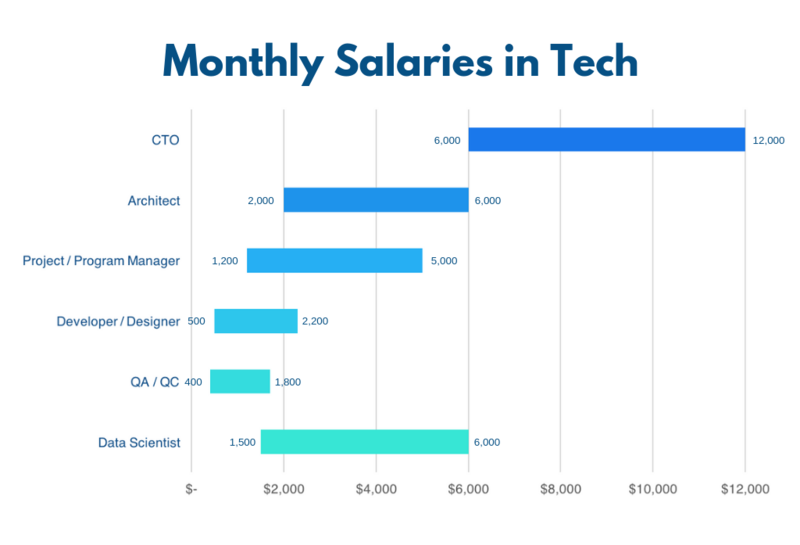 Salaries for senior developers (3-7 years) may range from $1,000 to over $2,000. 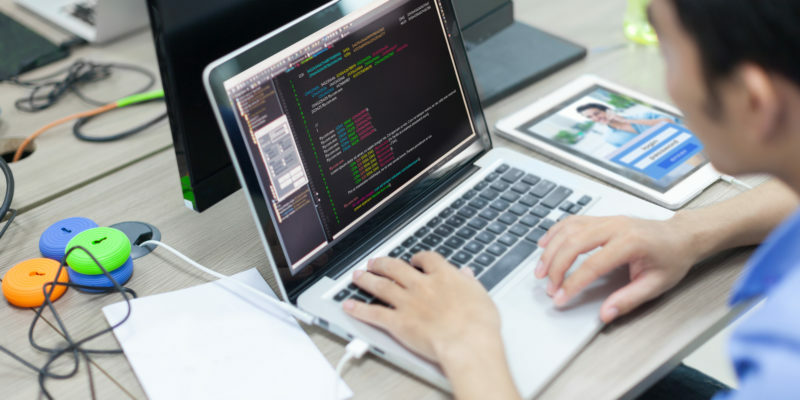 However, there is often a premium for skills in relation to front end developers, mobile developers and developers with expertise in Ruby on Rails. Senior fullstack developers are also in demand, particularly with tech startups. UI / UX designers are slightly more expensive than Developers, ranging from $600 to over $2,000. Of course, higher salaries usually have higher expectations of the individual’s prior experience, professionalism and ability to add value. Roles offering a higher salary are also likely to require longer hours and greater responsibilities. Roles offering lower salaries may have to compromise on the requirements asked of the role or offer alternative benefits. Employers need to make a range of tax and social insurance payments for each of their employees in Vietnam. Compulsory charges for the employer include health insurance, social insurance, unemployment insurance and trade unions fees. The final figure may be influenced by salary packaging, deductions and maximum contribution limits, but these obligations may add up to 23.5% to the employee’s base salary. A more detailed guide is available here. Some staff may expect that the employer will pay the agreed salary, and the employer’s compulsory tax and insurance obligations, but also the employee’s obligations for personal income tax and social insurance. Many IT professionals will remain focused on a net salary during negotiations, exposing employers to these additional costs. While negotiating on the basis of a gross salary is becoming more common, particularly in larger companies, make sure you are clear as to the basis you are negotiating with a potential staff member. If your company commits to pay the employee’s obligations, this may add a further 15%-35% to the total cost of the employee (depending on the employees salary and marginal tax rate). It’s commonplace to include a bonus for Lunar New Year of one month’s salary. This bonus is separate from any performance-based bonus and, in practical terms, is expected by most employees. An annual company party is expected, often extending to a company trip. This is usually domestic but may also include a destination outside of Vietnam. Some companies offer a increased bonus (2 months or more) and profit-sharing or equity, but this is relatively rare. Private health insurance can be a welcome addition and can be provided by an employer in a relatively cost-effective way. Training allowances are important for some roles. Smaller incentives such as lunch, flexible working hours or premium office facilities might also be considered. Launching your own team in Vietnam or finding new talent is certainly easier with help from local experts. Find out more about how we can help your project succeed in Vietnam.